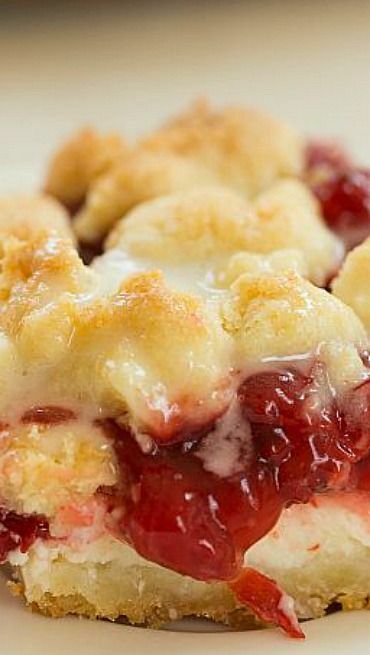 Layers of cream cheese and cherry pie filling sandwiched between crumb layers and drizzled with icing. Make the Crumb: In a medium bowl, whisk together the flour, sugar, baking powder and salt. Use a fork or pastry cutter to blend in the butter, and then the egg (the dough will be crumbly). Press half of dough into the prepared pan and bake for 8 to 10 minutes, until light golden brown. Set on a wire rack to cool. Make the Filling: In a separate large bowl, beat the cream cheese and sugar on medium speed with an electric mixer until smooth, about 2 to 3 minutes. Add the vanilla extract and mix to combine. Using an offset spatula, spread the cream cheese mixture into an even layer over the crust. Spoon the cherry pie filling in an even layer over the cream cheese mixture. Crumble the remaining dough evenly over the cherry layer.